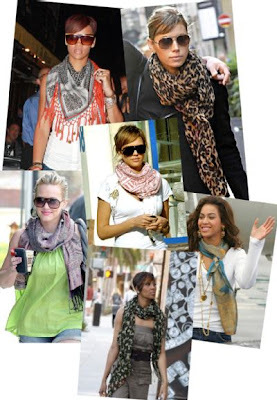 Now comes Fall and it's time to bring out your scarf and shawl collections again. Summer is finally over and although we only have two seasons here in Indonesia (Summer & Rainy Season) but we like to dress like it's Fall here ^o^ Scarfs are great for early fall when you still wanna wear your summer clothes but needs something to fight the wind and the cool air. When the weather gets more chillier then all you have to do is just change to a wider and thicker shawls. One of my favorite accessory is scarf, there are quite many styles of scarfs but my favorite is a thin longer one that I can wrap around my neck like this dark navy scarf that I wear a lot. I also love the colorful version and the metallic color version of this one. I wear this scarf with everything. I've worn it with tees, blazers, jackets and tanktops. It really is versatile. You could wear it loosely, wrap it one time, wrap it several time or tucked it into a bow. Of all the Scarfs available in the market I prefer the knitted ones because of the feel of the fabric and the way it falls nicely on my torso. The thin and lean shape also match our weather here which is not too cold like winter. Brilliant post! 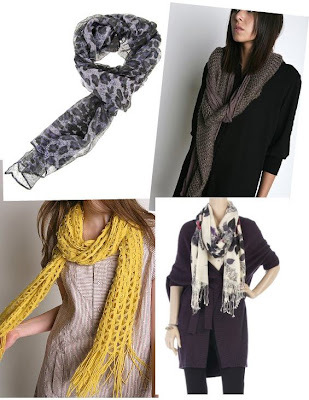 I absolutely love scarfs... I shall defo have fun trying some of these! Lovely post! Dropping by. Have a nice day! Thanks shopaholic, can't wait to see what you came up with the scarfs ^__^ I'll stop by your blog.. I'm off for a while !